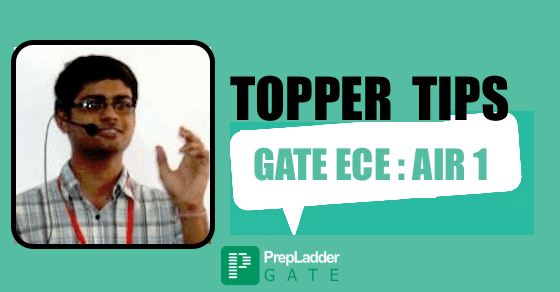 Prepladder shares the Preparation Tips for GATE 2017 by Sujith Kumar Billa who emerged as the Topper in GATE 2013 by securing AIR 1. In this article, Sujith Kumar shares preparation Tips and his experience for each subject. Let’s have glimpses of his journey of GATE Preparation…. After passing out B. Tech (ECE) in 2010, he started working at Kritikal Solutions on the Profile of Embedded Systems Engineer. His first attempt at GATE was in 2011, wherein he took the exam without any preparation and only went through EMT book by Sadiku. Consequently, he secured 42 marks with AIR 4898. His second attempt at GATE was in 2013 wherein he successfully emerged as the Topper. He commenced his preparation 10 Months prior to the exam in April. He started figuring out his conceptual levels in each subject. He joined a Coaching Institute wherein he had to inevitably miss some of the initial classes and his actual preparation commenced from mid August. Next, he made schedule and assigned time to each subject as per his previous experience. He started off with this subject which had been taught last at the coaching institute. He referred to the book ‘Engineering Circuit Analysis’ by Hayt and Kemmerly.He took note of the points which he felt tough in a notebook in order to facilitate faster revision. 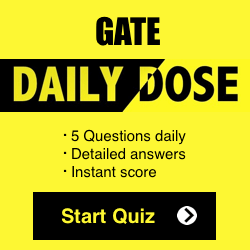 After completing each chapter, he solved questions from R.K. Kanodia GATE book. He followed the same pattern for all the subjects. He attended all the classes of network Theory at the Coaching Institute since it taught him new concepts and problem-solving methods. He was very confident of this subject, specifically Combinational and Sequential Circuits. He referred to the book ‘Digital Logic and Computer Design’ by Morris Mano. He followed ’Digital Systems: Principles and Applications’ by Ronald J. Tocci for Logic Families and Data Conversion Circuits Part. At the end of his preparation, he concluded that Digital Electronics was easier in comparison to other subjects and highly scoring subject from GATE perspective. This was the subject that was taught at the beginning in the Institute. He prepared this subject parallel to the Institute Classes.He referred to ‘Signals and Systems’ by Oppenheim and Willsky. He came across new concepts in every class at the Institute. Every time he went through the Streetman and Banarjee book, the concepts appeared new to him. He had to undergo several revisions to get a grip over a few concepts. It took him a large amount of time to go through this book. He also went through ‘Semiconductor Device Fundamentals’ by R.F. Pierret. At the end, he realized that the various books had nearly the same content. He thoroughly focused on this subject and found the lectures at the Coaching Institute very interesting. He referred to the Boylestad and Nashelsky book for this subject.Two and a half months prior to the exam, he went through the concepts of Op-Amps, Capacitors in MOSFET, Rectifiers, Signal Generators and Wave Shaping Circuits from the Sedra and Smith book. Two weeks prior to the exam, he prepared CMOS Inverter and Differential Amplifier and went through the concept of Feedback one week prior to the exam. After completing the preparation for this subject, he realized that various different techniques existed for solving problems on finding Gain, Input and Output Resistances. The Institute Classes proved to be very effective for this subject and he prepared this subject at parallel with the Institute classes.He prepared this subject and Communication Systems simultaneously since he was running short of time. He referred to ‘Modern Control Engineering’ by ‘Katsushiko Ogata’ for all the topics. For Polar and Nyquist Plots, he referred to “Schaum’s Outline of Feedback and Control Systems” and followed ‘Control Systems Engineering by Norman Nise’ for Stability Analysis. He referred to the book, ‘Communication Systems: 2nd Edition’ by Simon Haykin .He started off with Amplitude Modulation and went through NPTEL lectures. Next, he started Angle Modulation and covered it through the NPTEL lectures. For Digital Communications, he referred to NPTEL lectures which proved to be so much useful that he was able to do ‘Probability of Error Calculations’ for basic Modulation Techniques within 2 to 3 steps. Simultaneously, classes for Analog Modulation commenced at the Institute which he found very effective for brushing up his concepts.He found his preparation this time to be more effective than his previous attempt. EMT is classified into Basics and Applications as per the GATE syllabus. For the Basics part, he referred to ‘Elements of Electromagnetics’ by ‘Sadiku’. He also followed ‘Electromagnetic Waves and Radiation Systems’ by Jordan and Balmain for Basics. Vector Calculus and Differential Equations proved to be very effective while preparing for the Basics part.I referred to ‘Antennas and Wave Propagation’ by ‘Harish and Sachidananda’ for Antenna Theory. English proved to be a tough subject for him since his schooling was in Telugu. He relied on the teachings provided in the Classes for English preparation. He referred to the Internet for ‘Reading Comprehension’ part. He solely relied on Class-room preparation for General Aptitude. He believes that General Aptitude questions are relatively easy in GATE and one does not require extra skills to solve them. I referred to ‘Higher Engineering Mathematics’ by B.S. Grewal for Complex Analysis and Vector Calculus.I referred to ‘Advanced Engineering Mathematics’ by ‘Erwyn Kreyszig’ for ‘Differential Equations and Vector Calculus’ and ‘Shanti Narayan’ for Calculus. He relied on Classroom Preparation and solved the previous year papers in the last month for this subject. He dedicated ten days to solving 7 previous year papers from 2004 to 2010 and strived to solve them within 3 hours.He dedicated the final two weeks to revising all the Topics without solving any problems. He attempted two mock tests at the Institute and verified his answers with the exam key and worked on his weaker areas. 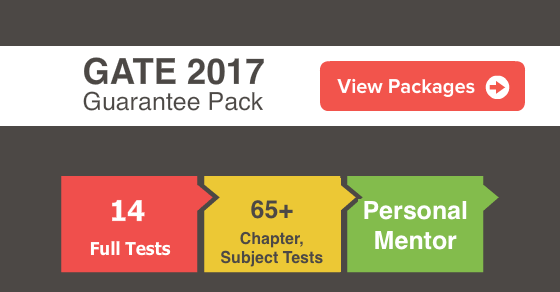 We are sure that Preparation Strategy followed by ‘Sujith Kumar’ will also guide you in your GATE EC 2017 preparation.